Since we had access to a CNC turret punch and a CAD system, it was easy to shape the area around the driver and we made it out of steel for a little more protection. 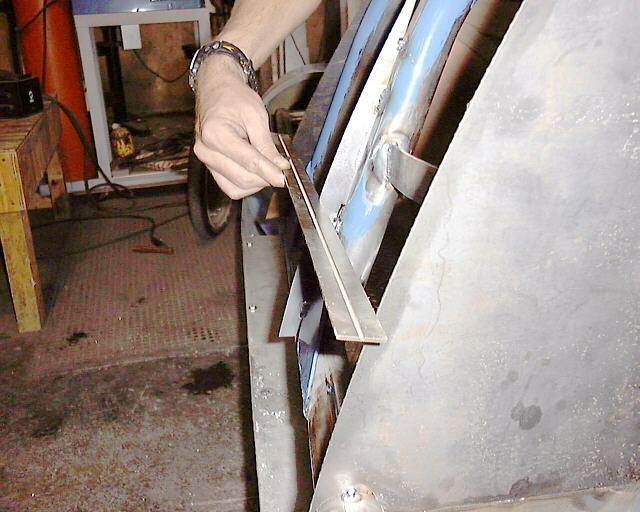 Here we're aligning a custom punched rib piece to be welded on the roll cage. This is a last check of the rib alignment before we cover it with sheet metal. 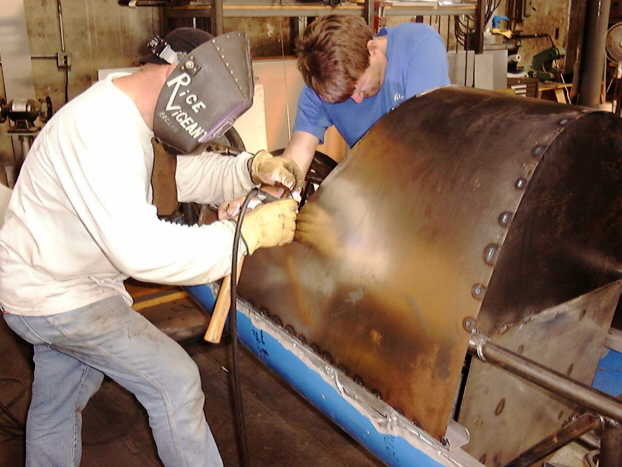 Mark is welding on the steel drivers compartment body while Alan holds the parts in alignment with hammers to keep the heat distortion to a minimum. We knew that a NACA Duct was about the lowest-drag scoop available but unfortunately we put them in a place where the boundary layer of air tends to pull away from the body. By now, the steel tubing and skin was starting to show a little rust. We were basically done welding, so we unbolted everything, and had the frame cleaned and epoxy painted. This was one of the few things we didn't do ourselves. The final frame and roll cage back from the painter's shop. Just forward of the NACA Ducts are 4 inch round windows so that the driver can get a wider field of view. I know of at least one accident caused by the driver not having enough field of view. 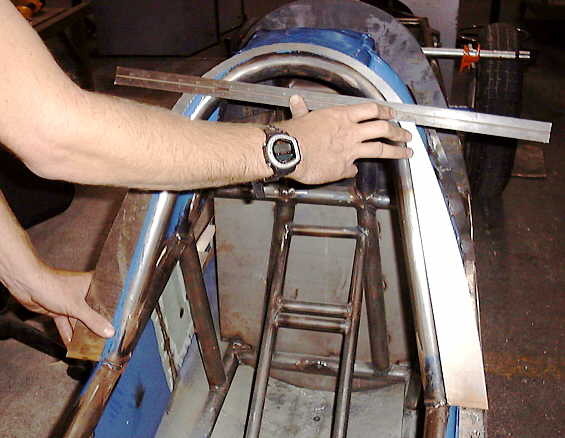 Beyond the 1-5/8 inch mild steel central roll cage area the frame is 1-3/8 to save a little weight. Most of the triangle bracing is 1 inch tubing. All of it is 1/8" (.125) thick. The frame is perched on one of our "Skateboards" that we use when working on the car. Normally each axle's wheels would rest on one, this raises the car up to a more comfortable working height and lets us move it around much easier. 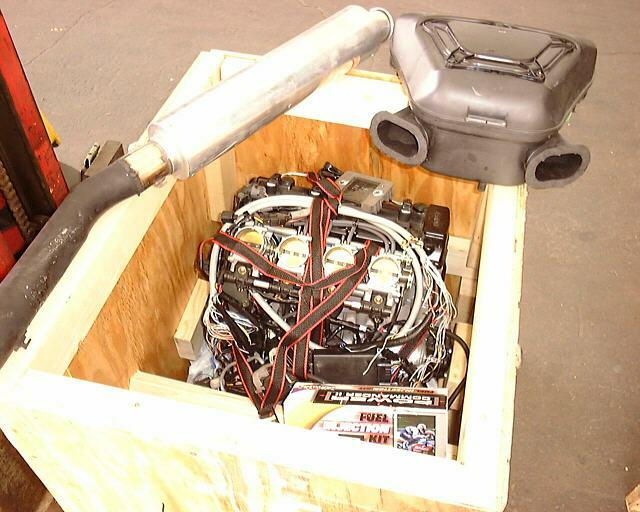 In late October 2000, a large crate arrived at James work, the Hayabusa motor we bought off of Ebay. Here it is, seconds after opening the crate. We didn't actually install it in the car until summer of 2001. To read about that go here. To see what happened next visit early 2001, or to see what happened before, visit mid 2000.